For every sport event or practice run, imagine having to rely on a stopwatch to keep track of start and finish times. Not very accurate, is it? That’s why a couple of Dutch guys pioneered an automatic timing system, now 33 years ago, using radio-controlled racing cars. They founded their sports timing business, called AMB i.t., in 1982 in Haarlem, The Netherlands. Just like any sports club at that time, their local RC track relied on stopwatches and thumbs to time laps. The two friends – big RC aficionados – figured that there had to be a more user-friendly way to keep track of racing times. They decided to put their technical skills to work and came up with the idea of transponder timing. Transponders were mounted onto their model cars and a detection loop was embedded in the track. AMB i.t. built all the components needed to create the world’s first automated timing system. Word of the system spread quickly in the world of motorized racing. It didn’t take long before the world’s biggest racing series, such as NASCAR and IZOD IndyCar, partnered AMB i.t. to provide a reliable source of timing. And many more followed. A similar story starts in 1993. Another Dutch company, called ChampionChip, was founded in Nijmegen. 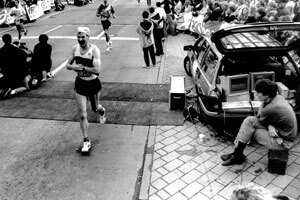 They invented a timing system for mass running events, using chips on athletes and electromagnetic receptors at the start and finish lines. Once again, this system was a world first. The ChampionChip system completely rejuvenated the athletics world. No longer endless queuing for registration. No longer the need for an army of volunteers. No longer the stress of providing reliable timing by hand, especially in major marathons in which thousands of athletes compete. Automatic timing meant that runners no longer had to jostle for a good start, since their times could be measured from the actual moment they crossed the start line. The system made the lives of participants and organizers a lot easier. In the years that followed, both companies focused on innovating and developing new timing systems for a variety of sports. In 1996, the first personal transponders were introduced. 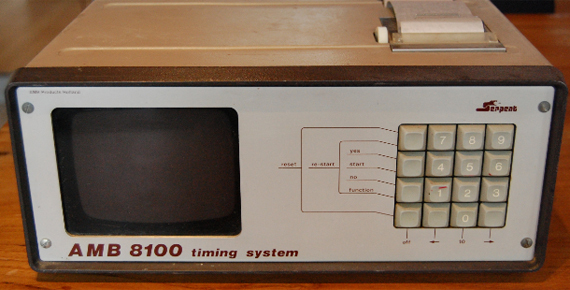 Intermediate timing was made possible in 2000 by developing the first multi-loop timing systems. In 2003, an online service was launched, with which event organizers, race clubs and track owners could publish their event and practice results on mylaps.com. AMB i.t. and ChampionChip decided to join forces in 2008. They merged into the new brand MYLAPS Sports Timing. A logical choice for two companies founded and based in the same country and both having evolved into world leaders in the same type of industry. With their shared technology and innovation, the merger was highly successful, and MYLAPS continues to maintain top position in the sports timing business. MYLAPS expanded its services to enhance as much of the sports experience as possible, including event planning and event registration. Over 20 million athletes and racers perform in MYLAPS-timed contests each year and over 700,000 users regularly use mylaps.com to analyze times and performance data and share their results with friends. The RC’s are still used at the head office of MYLAPS today. But not just for fun. They play a role in the ongoing search for better results and even greater accuracy. Our passion has always been about sport and technology. The pioneering spirit has never left the company. We constantly explore, test and research new ways to offer the best timing solutions for sports events worldwide. New services from MYLAPS include automated event registration and social media updates.